I made several guttural noises while watching tonight’s episode. The reason was simple: this looks a really fun wagering situation, but only one player has any wiggle room. Did you see how these three scores are related, mathematically? If Megan doubles her score, she’ll have 17,200. 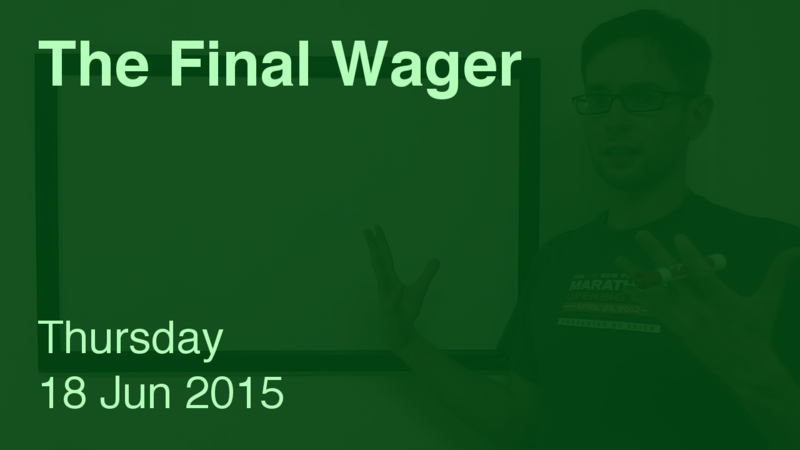 To cover this all-in wager, Brennan will need to wager 2,400. An incorrect response with that wager will leave Brennan with 12,400. It’s everything! Brennan could wager at most 2,400, and he’s now in a wager-to-tie situation. This one is known as FIRST = SECOND + THIRD. As I have in other circumstances, I recommend that Brennan add the extra dollar. It’s more likely that he and Megan will both nail it than Ian will be the only one to respond correctly. 2,401 6,200 ! 8,600 ! Ian: why even bother if you’re not playing to win? Megan: why are you giving up the shot at a tiebreaker? When I watched tonight’s Final Jeopardy!, I realized that this “First equals Second plus Third” wager to tie situation, but we don’t have ties, or co-champions anymore, so the question is “What is each player gonna do?” And afterwards, I was right on 2 out of 3 people, I knew that Ian would get the dreaded gray, because his $6,100 was not enough to win if Brennan misses and wagers appropriately, and I knew that Brennan made the only good wager tonight, although had this been when ties were allowed, Brennan would get the pink because if he missed and tacked on the extra dollar and Ian got it right and doubled up properly, Brennan would have lost to Ian by $1. And last, but not least, for some reason, I thought that you were going to give Megan a pink because Brennan could very reasonably wager for the tie. Yeah, I think red is a little harsh when Megan would have had to potentially give up $1000 just for the hope that Brennan makes a wager to tie that most people rightfully agree is inferior to the lockout wager. While I agree it’s not maximizing her likelihood of winning the game, it’s sacrificing very little in that regard for some extra assurance she won’t lose 2nd place if Ian were to do what he did (or go for his slightly more reasonable 6,199 play). For Final Jeopardy, I was hoping someone would answer E.L James. “American Pioneer” might fit the description. I think the +1 dollar question gets complicated a bit by the $1000 for second place. I’m not sure how much of what happened here was based on that competition, or just wagering blunders from the two challengers. The solo-get from 3rd place happened in just 7% of games last season. Ian’s first place equity with an all-in wager is about the same as his 2nd place equity with a wager of zero. Whether he considered that while wagering somewhere in between is tough to tell. But if Megan had gone with 8,600 and Brennan wagered extra (you normally don’t do this calculation unless someone screws up, but wagering up to 8,599 was probably safe for him), Ian would have gotten the best of both worlds. This is not to disagree with any of your analysis. If everyone was playing to win this game, wagers were very forced. It’s just interesting how that last $1000 can really influence EV and wagering strats from the trailers.